City destination Seoul: Looking for eco-friendly hotels, tours, activities and restaurants in the capital of South Korea? 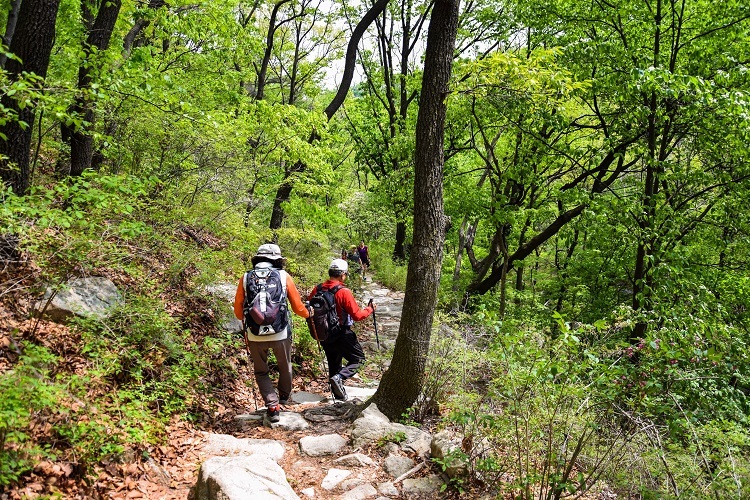 Here our recommendations for green accommodation, tours and healthy restaurants in Seoul. With many Asian flights going through Seoul Incheon airport, the city is becoming a popular destination for city breaks. Noisy, built-up, polluted city of skyscrapers – this is what you might expect from a typical megapole with 10 million inhabitants, not to mention the many commuters and tourists. What you are likely to experience though is a people-oriented city with green spaces accounting for almost a quarter of the city’s total area. Parks, terraces, riverbanks and abandoned spaces revived for cultural events, and promenades: Seoul has been making continuous efforts to transform the city and make it more livable. For visitors, the city is hardly walkable due to the large distances between tourist sites. However, there is a system of city bicycles, and tracks are quite convenient for short distances. Seoul also has an extensive public transportation network. The most efficient and environmentally friendly way of getting around. Trains run non-stop from approximately 5:30 am until midnight. All subway lines are color-coded and stations display signs in Korean, English, and Chinese. If you prefer to combine transportation with sightseeing, then busses are a convenient and affordable option. However, keep in mind traffic jams, which can make busses less efficient as mode of transport for exploring Seoul. Navigating your way around Seoul can feel complicated at first. Apps like Google maps help with finding best routes. Unfortunately, choice still seems to be limited for the discerning, environmentally conscious traveler. If you know of a hotel in Seoul which is offering a green, healthy experience or deserves to be featured here for its dedication to sustainability, please let us know! The number one attraction for Seoul tourists and citizens alike. A perfect way to escape the city’s hustle and bustle is to have a walk in one of the parks. One of them is a UNESCO World Heritage site – Changdeokgung Palace. Turn back time enjoying palaces and traditional architecture blended with blooming gardens and locals wearing traditional clothes. 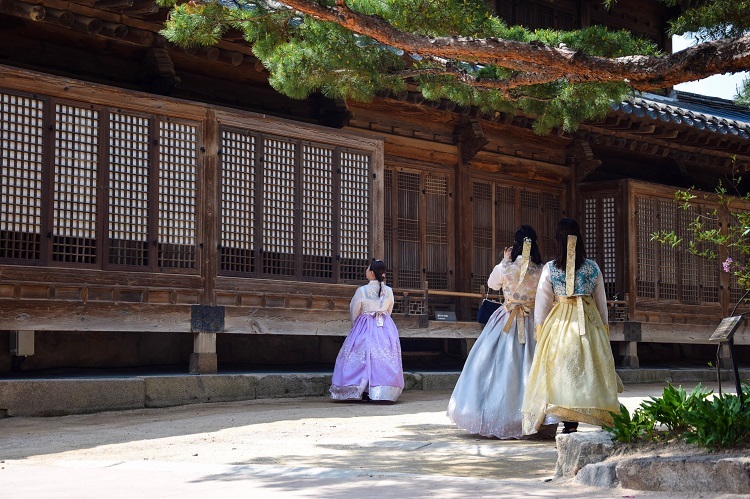 Tip: If you wear a traditional clothes, the entrance to all Seoul parks is free. Give it a try! A good example of urban redevelopment towards a more people-friendly environment. This is a green oasis which runs along dense lines of skyscrapers. The stream has passed through various stages of development. In the past, housewives used it for their laundry. Since 1976 it was hidden by an elevated highway. Citizens concerned with decreased aesthetic value of the city, environment, security and safety issues, started to push for restoration of the area, and to clean up the river. The restoration project was completed in 2005. Today locals spend their days and nights here, and the artistic vibe of the area attracts tourists as well. This national park (free entry) attracts hiking lovers, history buffs and culture explorers alike, with its granite peaks, forest trails, fortresses and temples. Check the weather forecast and try to go to the park on a sunny day for clear views from its various peaks. In a culture where the king of the table is meat, and a city whose culinary offering is mostly about serving famous Korean barbecue, it is hard to find healthy and vegetarian food. Below a few spots with fresh and less spicy food. 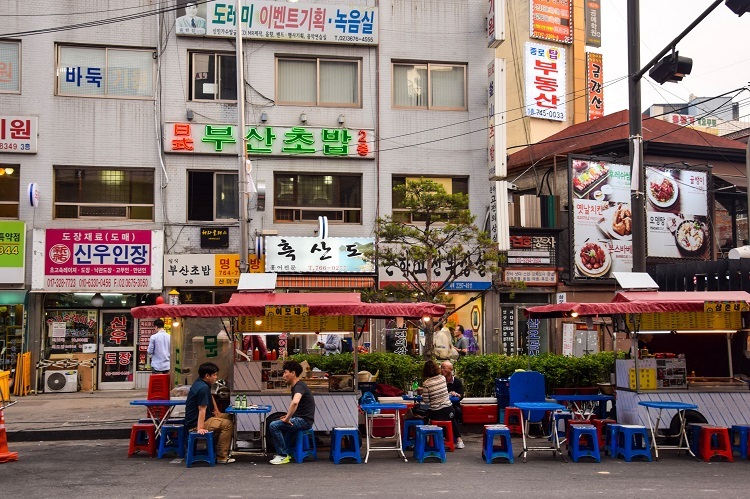 Koreans often eat outside, putting tables right on the streets. Usually, a table has a small stove where people can prepare food by themselves. Dinner may last from 7 pm till midnight. Tip: Many traditional eateries still preserve the tradition of eating on the floor. If you dine in such a place, you have to take off your shoes. Still need travel insurance for your upcoming trip to Seoul? We use World Nomads. Here’s why. Like our recommendations of hotels, activities and restaurants in Seoul, capital of South Korea? Spread the word!